Did you know there is a right and a wrong way to breathe? It’s true. And if you are like most people, you are probably doing the latter. Unfortunate, but not uncorrectable. Proper breathing requires contraction of the diaphragm–the main muscle of respiration. 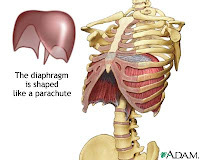 Many people stop using the diaphragm completely when they breathe, and instead kick in the accessory muscles of the neck and upper back. We call this dysfunctional breathing pattern chest breathing. To see if you are a chest breather, please read the article and watch the video below. Chest breathers tend to have higher incidences of neck pain, and they get less oxygen to the body on each breath. If you didn’t know that oxygen is necessary for cellular respiration, and thus life, you do now. Diaphragmatic breathing (or abdominal breathing) is essential for good health. If you are a chest breather, you can revert back to the natural diaphragmatic breathing you were meant to do. Just watch the video below to learn a quick and easy exercise to restore normal, functional breathing; and read this article if you want more information on breathing properly.